ΔcH°liquid: Standard liquid enthalpy of combustion (kJ/mol). ΔcH°solid: Standard solid enthalpy of combustion (kJ/mol). Cp,liquid: Liquid phase heat capacity (J/mol×K). Cp,solid: Solid phase heat capacity (J/mol×K). ΔfH°solid: Solid phase enthalpy of formation at standard conditions (kJ/mol). ΔsubH°: Enthalpy of sublimation at standard conditions (kJ/mol). ΔsubH: Enthalpy of sublimation at a given temperature (kJ/mol). S°solid,1 bar: Solid phase molar entropy at standard conditions (J/mol×K). ΔsubS: Entropy of sublimation at a given temperature (J/mol×K). ΔvapS: Entropy of vaporization at a given temperature (J/mol×K). Ttriple: Triple Point Temperature (K). 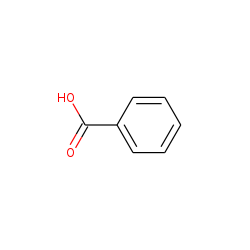 Find more compounds similar to Benzoic acid. Outlier This icon means that the value is more than 2 standard deviations away from the property mean.